Explanation: Giant spinning clouds of gas, similar to Earth's tornadoes, have been found on the Sun. Solar tornadoes, however, can be larger than the entire Earth, and sustain wind gusts over 1000 times stronger than their Earth counterparts. 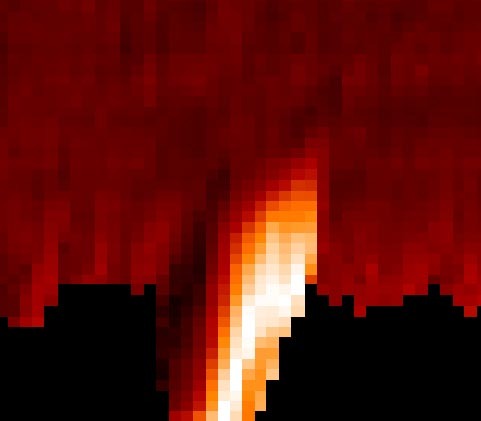 The SOHO spacecraft has found that solar tornadoes start low in the Sun's atmosphere and spiral outwards, gathering speed as they enter the Solar System. Earthlings have more to fear from Earth's own weather phenomena, though, because the high speed particles that result from solar tornadoes are easily stopped by the Earth's thick atmosphere. Earthlings may have much to learn from solar tornadoes, including details of how the solar wind and corona are powered, and how to better predict future solar particle storms that could damage sensitive satellites.